Cocteau came to London to paint these superb murals in Our Lady’s chapel, between November 3rd and 11th 1959. Cocteau was a multi-talented and well-known artist, already famous for his poetry, drawings, novels, films and plays. Such was his fame that a screen was erected to hold back the public and press while he painted the murals. He was an influential artist who, along with other famous contemporaries animated artistic life at that time. Cocteau received his honorary doctorate from Oxford University with the support of René Varin. Cocteau asked him if there was anything he could do in return. Varin suggested that he decorate a chapel at Notre Dame de France. The murals are dedicated to the Virgin Mary divided into 3 panels: the Annunciation, the Crucifixion and the Assumption. The murals are simplified drawings, lines with muted colours. Cocteau included a self-portrait within the Crucifixion scene on the left side of the altar. He arrived each morning at about 10am and always began by lighting a candle. He was heard talking to the Virgin Mary while working on the drawings. ‘O you, most beautiful of women, loveliest of God’s creatures, you ?were the best loved. So I want you to be my best piece of work too…?I am drawing you with light strokes….You are the yet unfinished work ?of Grace’. A beautiful Aubusson tapestry, above the altar, which is a work by this Benedictine monk of the En Calcat abbey. The theme of the tapestry is Paradise on earth with a reference to the Creation and to Wisdom. The New Eve, title given to Mary by the Church, is walking towards us as pure as a new bride. Dom Robert is a well-known tapestry artist of the 20th century. The key theme of his work is Nature as it emerged from the hands of the Creator of the world. There are frequent representations of vegetation and flowers in his work. He was a friend of Jean Cocteau, entered En Calcat Abbey in 1930. After 10 years spent at Buckfast Abbey in England, he went back to En Calcat. It was then that he started to produce works of art. The representation of Our Lady of Mercy above the entrance welcomes visitors as they walk in from the street and enter the church. Work of art of the famous French sculptor. He was head of the restoration work of Reims cathedral. Russian artist and mosaic specialist who was very active in England. He was very well known for his mosaics in Westminster Cathedral, the National Gallery and the Bank of England. In 2003 reordering work in the church led to the re-discovery of the mosaic by the artist in Our Lady’s side-chapel. 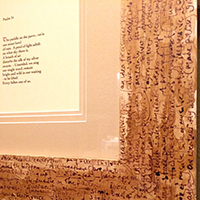 Original poem and handwritten manuscript in brown ink on stained wood. 40 x 40 x 2 cm. One of 20 original pieces. Text is from the book, Psalms in the Vulgar Tongue, by Clarke. A collection of 51 poems in the tradition of the Psalms. Exact copy of the statue of ‘Notre Dame des Victoires’ in Paris. Destroyed during the bombardments of 1940. The head was parachuted back into France in 1942 in order to be restored. Sculptor Henri Vallette re-sculpted the statue based on the dimensions of the head. In 1945 the full statue was brought back to London. Organ was enlarged in 1938 by J.W. Walker & Sons Ltd. Dismantled during the 1940 blitz of London and was rebuilt in 1955 by J.W. Walker & Sons. Organ renovated in 1986, modernised and refurbished by B.C. Shepherd & Son in 2010. Made of 12 paintings of 1x1meter, united in one. The piece was made and given by Timur D’Vatz to celebrate the 150th birthday of Notre Dame de France, in 2015.